"Footballers are pragmatists. You play for the manager you have." This is a quote from Roy Keane's autobiography [Page 76]. He was referring specifically to the Irish soccer players when Jack Charlton was the Republic of Ireland team manager, and to footballers in general. It would appear however that Keane had limits to his own pragmatism when it came to playing for Mick McCarthy as Irish manager. 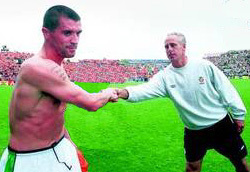 The dynamics of the relationship between Roy Keane and Mick McCarthy are central to the whole Saipan incident. Clearly the two did not get on with each other. The question is - why? Keane and McCarthy are the only ones who can give a definitive answer to this but based upon the available evidence it appears to be primarily due to an intense dislike of McCarthy by Keane. Roy Keane and Mick McCarthy only played together for Ireland on two occasions, in September 1991 and May 1992. There are no generally known reports of any issues arising between the two men as players on the football pitch. However it was while Mick McCarthy was the Republic of Ireland team captain that the first instance of some discord between the two has been documented. During the fateful squad meeting, that led to the expulsion of Keane from the Irish World Cup squad, the Irish captain brought up an incident that had occurred a full ten years earlier. The now infamous Boston 1992 row. from that time onward. A drunken 20 year old Keane had turned up late for the team bus at the end of a soccer tournament in the US. When the team captain Mick McCarthy challenged Keane about being late a heated row ensued. Roy Keane seems to have taken extreme exception to this. It is difficult to believe that such an event would even register the next day with Keane who seems to have spent his entire life going from one scrape to another. Keane admits in his autobiography that he has had hundreds or thousands of rows throughout his soccer career. Why should this one have been so significant to him? One possible explanation is that when Keane is drunk his, already low, tolerance levels become even lower. Any perceived slight is magnified disproportionately. Keane's autobiography is littered with stories about him getting into angry and violent situations when he was drunk. By his own admission there were many situations when he knew he should have walked away but his own sense of offence prevented him doing just that. These events seem to have made an indelible mark on his brain as they are recounted with real clarity in his book. It seems that a run of the mill, for footballers, exchange between McCarthy and Keane in 1992, magnified in intensity by his drunken state, soured Keane's view of McCarthy from that point on. There do not appear to have been any further meaningful interactions between the two until McCarthy was appointed as manager of the Republic of Ireland football team in 1996. In his autobiography [Page 246] Keane reveals an antipathy towards McCarthy that seems, to some extent, to be born out of Roy Keane's relationship with Jack Charlton. In his book Keane makes it clear that he had no time for Charlton "...I found it impossible to relate to him as a man or as a coach." [Page 54]. When commenting on McCarthy's appointment as Irish manager he said "McCarthy was part of the Charlton legend. Captain Fantastic...he didn't convince me. Still, when he got the job, I thought: let bygones be bygones." What bygones? Presumably the exchange between the pair in Boston six years earlier? In his World Cup Diary McCarthy makes a case that he had gone to some lengths as manager of Ireland to accommodate Keane and his sensitivities. He had made Keane the captain of Ireland at the first opportunity. He allowed Keane to turn up later than the other players for international matches. Keane was the only player in the Irish squad that roomed alone. He also says that he put up "...with the odd tantrum from Keane here and there...". McCarthy contends that if he was holding a grudge towards Keane from 1992 he would not have gone to these lengths. Roy Keane's first match for Ireland with Mick McCarthy as manager was an inauspicious occasion for the Manchester United player. Earning his 30th cap and wearing the captain's armband in place of the substituted Andy Townsend, Keane was sent off late in the match for kicking a Russian player. The next notable point of conflict between Keane and McCarthy was on the occasion of a Republic of Ireland trip to the USA for an end of season international tournament in 1996. Keane decided that he didn't want to go as he was too tired after the season just ended. [Page 246]. Rather than contact McCarthy or anyone else in the Irish set up, Keane left it to someone at Old Trafford to inform the FAI. "As a result I got off to a bad start with McCarthy. He felt I should have spoken to him personally. He expressed this opinion, casting me in a bad light. What he didn't tell the media that if we had that sort of conversation on this occasion, it would have been our first." [Page 247]. This begs the question, why couldn't Keane contact McCarthy directly? Why would this have been the first such discussion between the two men as manager and team captain? It certainly doesn't suggest that Keane had, in reality, let bygones be bygones. In his World Cup Diary McCarthy refers to the the 1996 USA trip. "I was never that bothered if he (Keane) went to America or not...it became a big media story...We have had a few chats to sort things out but it has all dragged on since then in the press." [Page 33]. In his autobiography Keane complains bitterly about the poor Republic of Ireland set up especially when compared to that of Manchester United. After the draw for the 2002 World Cup qualifiers was made Keane says that he met with McCarthy"...to level with him, to make the case for a reformed approach...We discussed the problems. He agreed with me...It was not and easy conversation - we're not not buddy-buddy...I thought we had a deal. "[Page 250]. Interestingly this meeting took place at Keane's house in Manchester. What is clear is that there was an unusual relationship between the Irish manager and his captain. Direct communication between McCarthy and Keane was kept to an absolute minimum. All of the available evidence is that was the way Keane wanted it. Keane admitted this in his interview with Tom Humphries in Saipan "I spoke to Mick Byrne, who's the middle man for me, really." For a man who has very admirable communication skills this is somewhat strange. Why would he need a middle man? The only possible explanation is that Roy Keane did not like Mick McCarthy and couldn't bear to be anywhere near him or have anything to do with him. During McCarthy's tenure as Irish manager Roy Keane took every opportunity to minimise his time with the Irish squad. "I dreaded the prospect of international weeks. "[Page 250]. With the benefit of hindsight and with the insights afforded by Keane's autobiography it is clear that there was no way possible that Roy Keane could maintain an even keel while being away with Ireland for the duration of the World Cup campaign. All of his complaints about the crowded airport, the missing training gear, the poor training facilities, the goalkeeper row, were just symptoms. Clearly McCarthy and the FAI could have done better but the inescapable conclusion to be drawn is that even if conditions and facilities had been perfect Keane simply could not endure being in such close proximity to Mick McCarthy for such a protracted period of time. A Saipan incident was inevitable even before Roy Keane set foot on the plane to that Pacific island.